One Arm Kettlebell Floor Press specifically targets the upper chest area and triceps with secondary emphasis on the front head of the shoulder. This exercise is effective in building size to the upper body while improving mobility and stability of the shoulder region. The use of the Kettlebell allows the wrist to rotate inward to a more natural position. 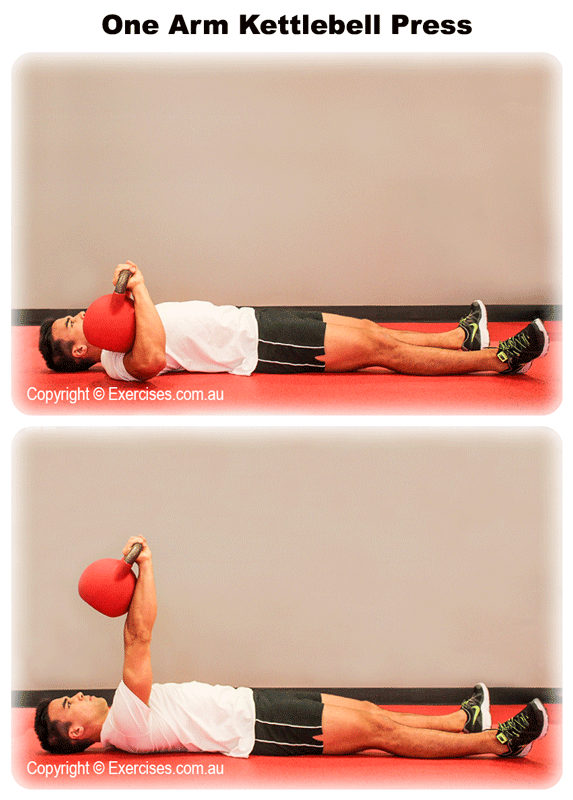 Lie on the floor alongside the kettlebell with its handle turned inward at shoulder level. Rotate your body toward the kettlebell, grab the handle, bring the kettlebell close to your chest and rotate back to starting position. Straighten out your legs and push your heels against the floor for greater stability. Press the kettlebell up in a straight line. You can turn your wrist in at the top to create a greater contraction in your middle chest. Bring the kettlebell down to its starting position. When your elbow touches the floor, hold for a count of “one” then repeat. The use of a kettlebell requires more balance and stability compared to a dumbbell. Although the floor press is a great mass builder, it is advisable to use moderately heavy weights for greater control. Some prefer to bend their knees but this puts compression forces on the back more so with the unilateral mechanics of this exercise. Keeping your legs straightened and your heels braced against the floor offers greater stability.